SUMMARY: Two decades following their description, the significance of Modic vertebral endplate and marrow changes remains a matter of debate. These changes are closely related to the normal degenerative process affecting the lumbar spine, and their prevalence increases with age. However, the exact pathogenesis underlying these changes and their relation to segmental instability of the lumbar spine and to low back pain remain unclear. In this paper, we review the literature relevant to this topic and discuss the currently available evidence regarding the pathologic and clinical significance of Modic changes. Type 1 changes (Fig 1) were hypointense on T1-weighted imaging (T1WI) and hyperintense on T2-weighted imaging (T2WI) and were shown to represent bone marrow edema and inflammation. Modic type 1 changes are hypointense on T1WI (A) and hyperintense on T2WI (B). Modic type 2 changes are hyperintense on T1WI (A) and isointense or hyperintense on T2WI (B). Modic type 3 changes are hypointense on both T1WI (A) and T2WI (B). Modic changes are uncommon in asymptomatic individuals without DDD.6,16,17 In the series of Toyone et al,6 only 9.6% of patients without DDD had such changes. Weishaupt et al16 reported a prevalence of 3%–10% among 60 asymptomatic volunteers 20–50 years of age. In particular, type 1 changes were only seen by 1 radiologist in 1 volunteer in 1 of 300 lumbar intervertebral spaces. In a population-based sample of four hundred twelve 40-year old Danes, Kjaer et al17 observed Modic changes in the lumbar spines of 9.6% of subjects without DDD and 34.1% of those with DDD. According to Modic,15 the altered signal intensity detected by MR imaging is not, in and of itself, the causal pathologic process but rather a reflection of the causal process, which is some type of biomechanical stress or instability. Karchevsky et al10 concluded that these changes likely represent a response of the bone marrow to the degenerative process involving the disk. In fact, type 1 changes have been shown to develop in 8% of patients following diskectomy and 40% following chemonucleolysis, which may be viewed as models of accelerated disk degeneration.15 Kokkonen et al22 observed a strong positive correlation between Modic changes and disk degeneration and proposed that endplate degeneration is more likely to be a sequel in the process of disk degeneration than a factor contributing to disk damage. Crock23 suggested that repeated trauma to intervertebral disks results in the production of inflammatory mediators in the nucleus pulposus and that diffusion of such toxic chemicals through vertebral endplates could result in a local inflammatory reaction resulting in LBP. Brown et al24 studied specimens of intervertebral disks, vertebral endplates, and adjacent cancellous bone they obtained during anterior diskectomy and fusion from patients with chronic LBP and DDD. They observed cracks and defects in the vertebral endplates, with increases in vascular density and the number of sensory nerve fibers, and hypothesized that such changes could represent a means of increasing disk nourishment and could be a source of LBP in patients with DDD. Burke et al25 observed a greater increase in proinflammatory mediators such as interleukin-6, interleukin-8, and prostaglandin E-2 in the disks of patients with type 1 Modic changes undergoing fusion for LBP than in those of patients undergoing diskectomy for sciatica. These authors proposed that the production of proinflammatory mediators within the nucleus pulposus may be a major factor in the genesis of diskogenic LBP. Vital et al26 concluded that Modic type 1 changes correspond to edema of vertebral endplates and subchondral bone. This edema could correspond to microfractures of cancellous bone and endplate cracks accompanied by an increased vascular density along with an increase in the number of nerve endings and in the levels of proinflammatory chemical mediators, and these vascular and inflammatory changes would follow the initial mechanical phenomena. Schmid et al9 found a positive correlation between the presence and extent of Modic changes and the amount of cartilage in the extruded disk in patients undergoing lumbar microdiskectomy and concluded that these changes may result from avulsion-type disk herniation. Ohtori et al27 found that the cartilaginous endplates of patients with Modic changes had more protein gene product (PGP) 9.5 immunoreactive nerve fibers and tumor necrosis factor (TNF) immunoreactive cells than those with normal endplates. PGP 9.5 immunoreactivity was seen exclusively in patients with diskogenic LBP, whereas TNF immunoreactivity was seen in both patients with LBP and healthy controls. In addition, the number of TNF immunoreactive cells in endplates with Modic type 1 changes was higher than those with type 2 changes. The authors concluded that inflammatory cytokines and nerve ingrowth into vertebral endplates may be a cause of diskogenic LBP and that type 1 changes, representing more active inflammation, seem to be mediated by proinflammatory cytokines, whereas type 2 and 3 changes could be more quiescent stages of the process. In a randomized controlled trial, Korhonen et al28 found that infliximab, a monoclonal antibody against TNF-α, was no more effective than placebo in the treatment of disk herniation–induced sciatica. However, the authors noted a trend toward better results in the infliximab group when a Modic change was colocalized at the symptomatic level. Fayad et al29 found that patients with chronic LBP and predominantly type 1 inflammatory Modic changes had better short-term relief of symptoms following intradiskal steroid injection than those with predominantly type 2 changes, which further supports the inflammatory nature of Modic type 1 changes and the role of inflammation in the generation of LBP. Kjaer et al17 suggested that Modic changes constitute the crucial element in the degenerative process around the disk in relation to LBP and clinical findings. They demonstrated that DDD on its own was a fairly quiet disorder, whereas DDD with Modic changes was much more frequently associated with clinical symptoms. Most authors agree that, among Modic changes, type 1 changes are the ones most strongly associated with LBP.6,8,13–15 In a study of 74 patients with DDD, Toyone et al6 observed that 73% of patients with type 1 changes had LBP as opposed to only 11% of those with type 2 changes. Mitra et al8 found a positive trend between the evolution of type 1 Modic changes into type 2 changes and the improvement of symptoms. In addition, they observed that patients in whom type 1 changes increased were clinically worsened. Albert and Manniche14 reported a strong association between Modic changes and LBP as 60% of patients with Modic changes but only 20% of those without such changes had LBP. These authors also showed that type 1 changes were more strongly associated with LBP than type 2 changes. In a study of 228 Finnish middle-aged male workers, Kuisma et al13 found that Modic changes at L5-S1, especially type 1 changes and extensive lesions, were strongly associated with pain symptoms and LBP. The relationship between Modic changes and diskogenic LBP remains a matter of debate.4,7,22,30 Braithwaite et al4 and Weishaupt et al7 showed that Modic changes have a very high specificity (96%–96.8%) and positive predictive value (88%–91.3%) for pain reproduction during diskography in patients with chronic LBP. In contrast, other MR imaging findings such as advanced disk degeneration and high-intensity zones were found to be much less specific for diskogenic LBP. Weishaupt et al7 further demonstrated that moderate and severe Modic changes (ie, those extending over 25% or more of the vertebral height) have a specificity and positive predictive value of 100% for a concordant pain response on diskography. The findings of these authors have been challenged by those of Sandhu et al30 and Kokkonen et al,22 who failed to demonstrate any significant association between the presence of Modic changes and pain provocation during diskography in patients with chronic LBP. Given the limited sample sizes in these studies and their conflicting results, no conclusions can be drawn at this time with certainty regarding the relationship between Modic changes and diskogenic LBP. The relationship between Modic type 1 changes and segmental instability is mostly supported by indirect evidence coming from outcome studies following lumbar fusion.26,33–36 In a study assessing osseous union following lumbar fusion in 33 patients, Lang et al33 found that all 19 patients with solid fusion had type 2 Modic changes, whereas 10 of 14 patients with nonunion had type 1 changes. They concluded that the persistence of type 1 Modic changes after fusion suggests pseudarthrosis. Buttermann et al34 similarly observed that nonfusion was associated predominantly with the persistence of type 1 Modic changes. In a study of 56 patients treated with anterior lumbar interbody fusion for LBP, Chataigner et al35 found that patients with type 1 Modic changes had much better outcomes than those with isolated DDD and those with type 2 changes, in whom the results were generally poor. Vital et al26 assessed clinical and radiologic outcomes following instrumented posterolateral fusion in 17 patients with chronic LBP and type 1 Modic changes. Six months later, all type 1 changes had converted, 76.5% into type 2 changes and 23.5% back to normal, and clinical improvement was seen in all patients. They concluded that fusion accelerates the course of type 1 Modic changes probably by correcting the mechanical instability and that these changes appear to be a good indicator of satisfactory surgical outcome after arthrodesis. In a study of 60 patients with severe chronic LBP and single-level DDD treated with instrumented fusion, Esposito et al36 showed that patients with type 1 Modic changes had excellent results and improved much better than patients with type 2 changes whose clinical outcome was poor. Braithwaite et al4 suggested that Modic changes can convert from one type to another and that they all present different stages of the same pathologic process. Mixed-type changes are assumed to develop before conversion to one of the true Modic types.4,26 In their original study, Modic et al2 followed 16 patients longitudinally. Among the 6 patients with type 1 Modic changes, 5 patients showed at least a partial conversion into type 2 within 14 months to 3 years, whereas the remaining patient demonstrated reverse transformation into Modic type 0. In contrast, none of the 10 patients with type 2 Modic changes showed a change during the 2- to 3-year follow-up period. The authors concluded that type 2 changes are stable and unchangeable with time, whereas type 1 changes are unstable. This view was supported by a greater prevalence of type 2 changes in their study. 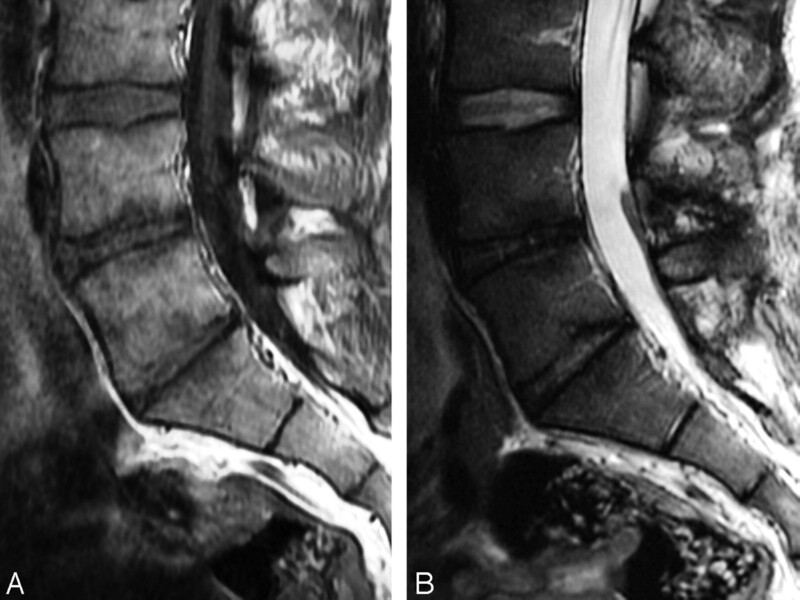 It is generally agreed that type 1 changes are unstable lesions.2,8,15,26 Vital et al26 demonstrated that all type 1 changes converted into either type 2 changes or back to normal within 6 months following lumbar fusion, which paralleled clinical improvement in all patients. In a longitudinal study of 44 nonoperated patients with LBP and sciatica followed for 12–72 months, Mitra et al8 found that 92% of type 1 changes either converted wholly or partially into type 2 changes (52%) or became more extensive (40%) and that only 8% of these changes remained the same. They concluded that type 1 Modic changes are dynamic lesions that, in most cases, either increase in size or convert into type 2 changes. The stability of type 2 changes has been recently questioned by several authors.5,12,14 Kuisma et al12 studied the natural history of Modic changes in 60 nonoperated patients with sciatica. They found that 14% of Modic changes evolved into another type within 3 years, 80% of the conversions being from type 2 to either type 1 or mixed type 1/2. They also found that nonconverted Modic changes increased in size and that new Modic changes developed adjacent to degenerated disks in 6% of patients, 77% of these new changes being either type 1 or mixed type 1/2. 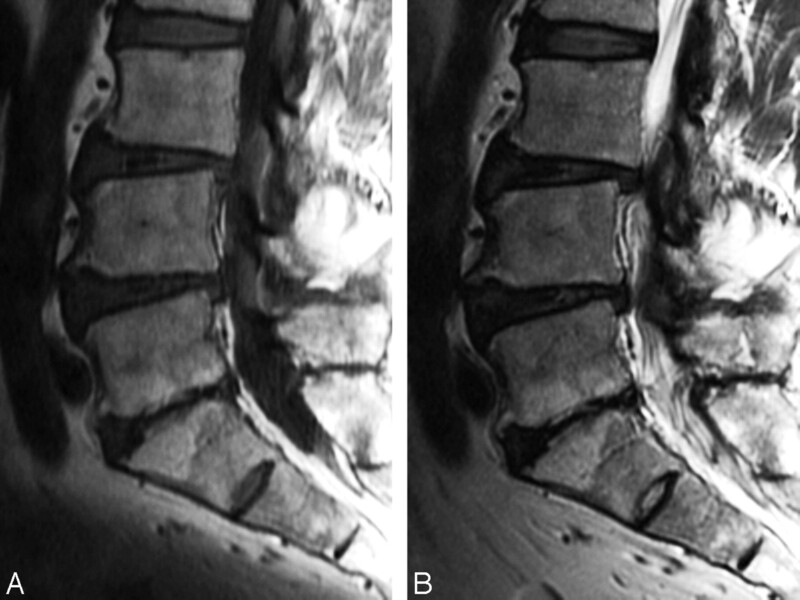 They concluded that type 2 changes may be less stable than previously assumed and speculated that an acute ongoing inflammatory process in some type 2 changes causes conversion of yellow to red marrow, which suggests superimposed changes such as continued or accelerated degeneration, a view shared by Modic.15 In a study of 166 nonoperated patients with sciatica undergoing repeat MR imaging at 14 months, Albert and Manniche14 found that the prevalence of Modic changes increased from 9% at baseline to 29% at follow-up, all new changes developing at the level of the previous disk herniation. In addition, many patients with preexistent Modic changes developed additional type 1 changes. They concluded that lumbar disk herniation was a strong risk factor for developing Modic changes, especially type 1, during the following year. Marshman et al5 reported on 2 patients who showed reverse transformation of type 2 Modic changes into type 1 changes despite a sustained chronic LBP severity. The authors concluded that type 2 changes are neither as stable nor as quiescent as originally believed and that Modic types 1 and 2 are instead interchangeable and equipotent in symptom-generating capacity. From this review, it appears that Modic changes are dynamic markers of the normal age-related degenerative process affecting the lumbar spine. These lesions can convert from one type to another with time, with mixed-type changes probably representing the intermediate stages in this conversion. Type 1 changes are likely to be inflammatory in origin and seem to be strongly associated with active low back symptoms and segmental instability, thus reflecting a state of active degeneration and biomechanical instability of the lumbar spine. 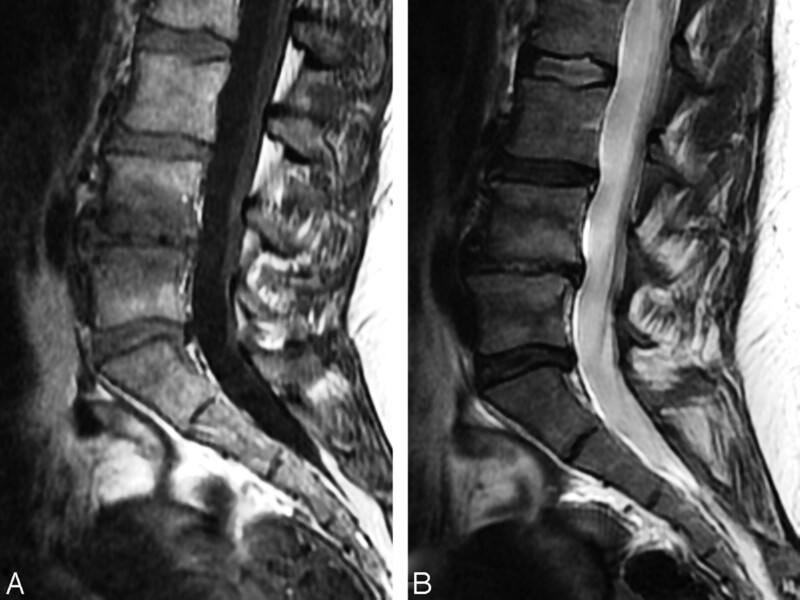 Accordingly, these changes appear to predict an excellent outcome following lumbar fusion. In contrast, type 2 changes are less clearly associated with LBP and seem to indicate a more biomechanically stable state, though superimposed stress may occasionally cause their reverse conversion into type 1 changes. Finally, the exact nature and pathogenetic significance of type 3 changes remains largely unknown.